USES: Azelastine is used to relieve nasal symptoms such as runny/itching/stuffy nose, sneezing, and post-nasal drip caused by seasonal allergies and other allergic conditions. This medication is an antihistamine. It works by blocking certain natural substances called histamines that are responsible for allergic symptoms. HOW TO USE: Read the Patient Information Leaflet provided by your pharmacist before you start using azelastine and each time you get a refill. Follow the instructions on how to properly use this medication. If you have any questions regarding the information, consult your doctor or pharmacist. Follow the instructions for properly priming the spray pump before using the bottle for the first time and if you have not used the medication for 3 or more days. Avoid spraying in your eyes or mouth. 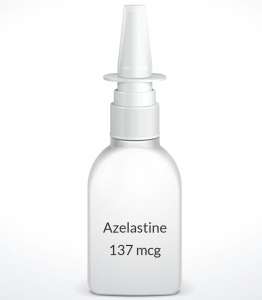 Azelastine is for use in your nose and is available in different strengths. Use 1 or 2 sprays in both nostrils, usually once or twice a day as directed by your doctor. The dosage is based on your condition, the product you are using, and your response to treatment. Use this medication regularly in order to get the most benefit from it. Remember to use it at the same time(s) each day. This medicine usually begins working within 3 hours of use. Inform your doctor if your symptoms do not improve. SIDE EFFECTS: A bitter taste in the mouth, drowsiness, a burning feeling inside the nose, sneezing fits, nausea, weight gain, muscle aches, and red eyes may occur. Strange feelings on the skin (e.g., pins and needles, crawling sensation) may also occur. If any of these effects persist or worsen, notify your doctor or pharmacist promptly. The bitter taste can be reduced by sniffing gently through your nose after each spray, rather than breathing in through your nose so deeply that the medication goes to the back of your throat and gets into your mouth. Remember that your doctor has prescribed this medication because he or she has judged that the benefit to you is greater than the risk of side effects. Many people using this medication do not have serious side effects. A very serious allergic reaction to this drug is unlikely, but seek immediate medical attention if it occurs. Symptoms of a serious allergic reaction may include: rash, itching/swelling (especially of the face/tongue/throat), severe dizziness, trouble breathing. This is not a complete list of possible side effects. If you notice other effects not listed above, contact your doctor or pharmacist. In the US - Call your doctor for medical advice about side effects. You may report side effects to FDA at 1-800-FDA-1088. In Canada - Call your doctor for medical advice about side effects. You may report side effects to Health Canada at 1-866-234-2345. PRECAUTIONS: Before using azelastine, tell your doctor or pharmacist if you are allergic to it; or if you have any other allergies. This product may contain inactive ingredients (such as preservatives like benzalkonium chloride), which can cause allergic reactions or other problems. Talk to your pharmacist for more details. Before using this medication, tell your doctor or pharmacist your medical history, especially of: kidney problems. This drug may make you drowsy. Do not drive, use machinery, or do any activity that requires alertness until you are sure you can perform such activities safely. Limit alcoholic beverages. This medication should be used only when clearly needed during pregnancy. Discuss the risks and benefits with your doctor. It is not known whether this drug passes into breast milk. Consult your doctor before breast-feeding. DRUG INTERACTIONS: Your healthcare professionals (e.g., doctor or pharmacist) may already be aware of any possible drug interactions and may be monitoring you for it. Do not start, stop or change the dosage of any medicine before checking with them first. Before using this medication, tell your doctor or pharmacist of all prescription and nonprescription/herbal products you may use, especially of: cimetidine. Tell your doctor or pharmacist if you also take drugs that cause drowsiness such as: other antihistamines (e.g., diphenhydramine), anti-anxiety drugs (e.g., diazepam), anti-seizure drugs (e.g., phenobarbital), medicine for sleep (e.g., zolpidem), muscle relaxants, narcotic pain relievers (e.g., codeine), psychiatric medicines (e.g., phenothiazines such as chlorpromazine or tricyclics such as amitriptyline), tranquilizers. Check the labels on all your medicines (e.g., cough-and-cold products) because they may contain drowsiness-causing ingredients. Ask your pharmacist about the safe use of those products. This document does not contain all possible interactions. Therefore, before using this product, tell your doctor or pharmacist of all the products you use. Keep a list of all your medications with you, and share the list with your doctor and pharmacist. STORAGE: Store at controlled room temperature between 68-77 degrees F (20-25 degrees C) away from light and moisture. Keep the bottle upright with the pump tightly closed. Protect from freezing. Do not store in the bathroom. Keep all medicines away from children and pets. Do not flush medications down the toilet or pour them into a drain unless instructed to do so. Properly discard this product when it is expired or no longer needed. Consult your pharmacist or local waste disposal company for more details about how to safely discard your product.